Need space? You need Armstrong Steel. Steel buildings now account for almost 70 percent of all new low-rise construction in the United States, in part due to cost efficiency. Now find out how much you can save! Fill out the form below to get a price on your steel building with no obligation, or get started immediately by calling 800-345-4610. Instantly price your steel building below! It costs you nothing and you're under no obligation to purchase! In which state do you plan to build? This is a quick 10-minute conversation with one of our Construction Specialists to gather a bit more information and answer any questions you may have. Our building looks great! It was so easy to erect and I love the stability and overall quality of my Armstrong Building. My builder looked inside after completion and asked, 'Where did you get this building?!'. You guys hit a home run with your product. Thanks Armstrong! It was great doing business with Armstrong. You folks are great, extremely willing to work with your customers and I would recommend you to anyone thinking of purchasing a steel building. I would speak to any of your new customers about our experience with Armstrong! You guys have really solidified your business with us. I chose Armstrong for the building over bids from two very reputable local firms for several reasons and was not disappointed. Armstrong’s bid was very competitive with the other bids, but I was most impressed with the overall quality of the materials to be provided, the attention to detail by Armstrong engineers, and the design help provided. "As I began searching for a steel barn, there was one company in particular that went out of their way to say some outrageous things about Armstrong Steel and desperately used scare tactics. I'm glad I wasn't influenced by the lies. Everything has gone great, I couldn't be happier with Armstrong Steel! They have been there for me every step of the way. I cannot remember the last time that I received customer service like I have from Armstrong Steel. In short, everything went smoothly and you guys did everything we expected of you...it seems to be a part of your company’s culture. We’d recommend Armstrong Steel to anyone building a manufacturing facility! The people putting up the building, Able Construction, said this is the best engineered building they have constructed and they have put up 150 to 200 buildings. Timing was an extremely important factor for us and we knew no one in America could get a steel building on site quicker than Armstrong Steel - so the choice was easy. With all of the unscrupulous steel building companies out there today, we're glad we chose Armstrong Steel because we got what we paid for and THEN some AND they came through in a pinch! I'm extremely pleased with the way my Armstrong building turned out. This is the third steel building that I have assembled myself. The detailing on the building was top notch. Kitty in the shipping department was a pleasure to work with. The building was delivered just as promised. I rate this as an excellent building experience! Everyone at Armstrong does exemplary work. Thank you from the bottom of our hearts for a job so well done! 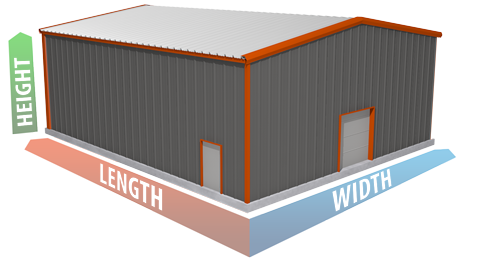 We would highly recommend you, your company, and all of your employees to anyone looking to purchase a steel building. We can’t put into words just how much we love our finished Armstrong Building! All of the work was done with such care, skill, and precision. It all went smoothly and we’re glad we chose Armstrong Steel. Our contractor and his crew were able to assemble our building in about 10 days. All of the components were accounted for and we were very pleased that there were no missing parts, even down to the smallest detail. It was great doing business with Armstrong. You folks are great, extremely willing to work with your customers and I would recommend you to anyone thinking of purchasing a steel building. Again, thank you and all the folks at Armstrong for a great experience with this project. We initially sent a building deposit to a well-known steel building company in Denver who we later learned had an established reputation for stealing people’s deposits and not delivering buildings. That was a huge mistake because we never got our building and they still have our money. Our first call should have been Armstrong Steel. I cannot remember the last time that I received customer service like I have from Armstrong Steel. In short, everything went smoothly and you guys did everything we expected of you. It seems to be a part of your company’s culture. We’d recommend Armstrong Steel to anyone building! When I was shopping for a 60' x 120' x 16' building, General Steel wound up acting like every company in the industry couldn't be trusted. I'm glad I didn't let them scare me out of choosing Armstrong Steel. I am very pleased with Armstrong Steel and would recommend them to anyone! Just thought I’d let you know the building is up and it looks absolutely freakin’ gorgeous! My county inspector has a Morton Building, he’s had problems with it now for the last ten years and he was shocked at how sharp my Armstrong building wound up. Even my neighbor walked over and went 'Oh my God!'. Thank you! I started by seeking a 60’ x 60’ x 14’ building. Armstrong Steel appeared to be the most professional. Their quote was simple and easy to analyze. The contractor that I had pour the pad is...very impressed with the quality of Armstrong Steel. He and I would recommend Armstrong Steel if you are considering a steel building for any of your needs. I can't thank you enough for all your help with this - the designs, the plans, the engineering etc. This is what we were hoping when we decided to go with Armstrong - and we sure are pleased and thankful. I have a good feeling other people will move in this same direction as us with your company. Thanks for your help! You guys just keep coming through for us and we want to give you and Armstrong a public pat on the back. I expected my Armstrong building to be high quality, but after actually unloading the building and seeing the structure, which went very well and with no damage, I was just really impressed! The church building is going great so far. Thanks for all your help, Armstrong! I really appreciate Armstrong going out their way to educate me and offer assistance in many areas. I hope all is well and really appreciate all you have done to create/deliver the building we always wanted. God Bless! The quality of the building blew us away - especially considering they had the lowest price. We expected it to be easy to erect but, wow! It was a breeze! The quality of the building was beyond anything we anticipated and the pre-galvanized framing was impressive. With all of the unscrupulous steel building companies out there today, we're glad we chose Armstrong Steel because we got what we paid for and THEN some! The buildings I ordered are of very good quality and we are pleased - they look great! Armstrong's employees always treated us with kindness and respect when we had questions or issues and attempts were always made to resolve our concerns or answer our questions. That sure goes a long way. Thanks guys! As I began searching for a steel barn, there was one company in particular that went out of their way to say some outrageous things about Armstrong Steel and desperately used scare tactics. I'm glad I wasn't influenced by the lies. Everything has gone great, I couldn't be happier with Armstrong Steel! They have been there for me every step of the way. Armstrong Steel was by far the best steel company to deal with. There was no high pressure sales, no nagging phone call. Everything was very straight forward and simple, from the ordering to the shipping and on thru the completion of the project. Armstrong made this project go smoother than I could have ever imagined. Call us now to speak to a Building Expert. *Since our founding, millions of contractors, builders, small business owners, do it yourselfers, their families and others have found Armstrong Steel when searching for information and possible use of a steel building.